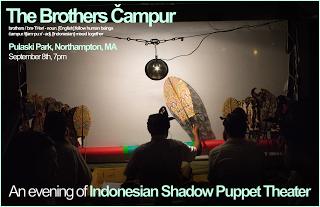 The Northampton Arts Council welcomes The Brothers Čampur to the stage for an evening of Wayang Kulit, in the park. Wayang Kulit is a form of traditional shadow-puppetry from Bali, Indonesia that brings together elements from the island’s rich cultural traditions: Hindu epics, complex music, leather carving, ritual, movement, and slap-stick comedy. Since 2012, The Brothers Čampur—puppeteers Putu Rekayasa and Panji Wilimantara, theatre artist Sam Jay Gold, and ethnomusicologist Ian Coss—have presented this dynamic art form to audiences in both Indonesia and the United States. They are thrilled to share their newest show under the stars in Downtown Northampton Pulaski Park for one night only. Witness heroes rescue loved ones, clowns fight demons, and Gods crack jokes about Twitter and Instagram — all from the shadows.